Looking for a personal gift idea? Most of my blankets are very quick to make so you should be able to whip one up before Christmas. Here's a roundup of many of the blankets I've crocheted and featured here on my blog. Check it out, you might be inspired! Do you have scraps of yarn laying around? Check out these scrap blankets! They are the perfect solution if you have time and yarn but not a lot of money. This yarn came mostly from a bag of yarn a friend gave me. It was so fun to go through and see what potential could come from a jumbled trash bag full of yarn. I was happy with how it turned out! 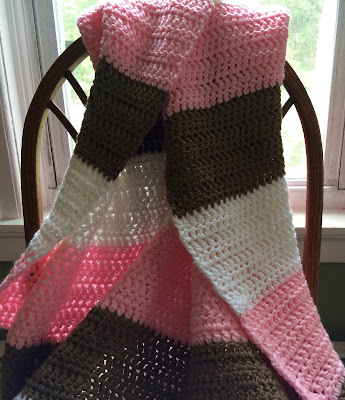 This one is another double crochet blanket in stripes. I love stripes! Here are some blankets that work up super quick. They combine two strands of yarn to make something nice, thick, quick and comfortable. This one is probably my favorite. I gave it to one of my nephews as a gift. You might recognize it from the homepage of my blog! I really like this one too. I made it for another of my nephews and gave it to him for Christmas last year. It's so warm and comfy! This is a more recent one. It's the same idea as the others just different colors and a different pattern of stripes. This one reminds me of the ice cream that you always seem to find at birthday parties: strawberry chocolate and vanilla. These next ones are granny square and granny stripe blankets. They are crocheted as just one giant granny square that continues to increase in size each round. When you get to the size you like, just stop! This next one is also a favorite of mine. I gave it to my niece for Christmas last year. I just love how all the colors came together. It is a granny stripe as opposed to a granny square. I also added a ruffle edge to make it just a little more special! If you want to see more of my crochet items, just check out the Crochet/Knit page found on this blog!